Splitfin Flashlightfish are thought to produce the brightest glow of any living organism – they can be seen from over 100 feet away! 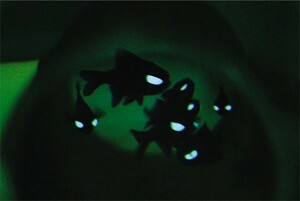 Bioluminescence is a chemical process by which some fish species can produce their own source of light. 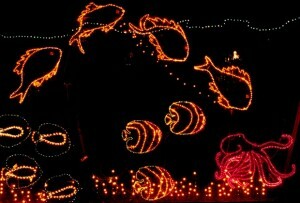 They have light producing organs known as photophores. The light is emitted from specialized cells called photocytes or from symbiotic fluorescent bacteria that are cultured by the fish in photophores. Most fish bioluminescence is blue (because blue-green light transmits furthest in water); this helps camouflage fish in open water because their counterillumination matches the ambient ocean color from above. 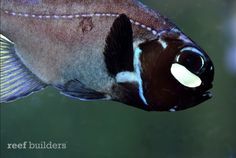 Other fish use different colors of bioluminescence, such as red or green or white, to reveal fish hidden by counterillumination, distract or confuse fish with bright flashes, or to signal to other fish (e.g., potential mates or members of their school). For examples of bioluminescent fish, check out the “twinkle twinkle little fish” post on the Fisheries Blog!